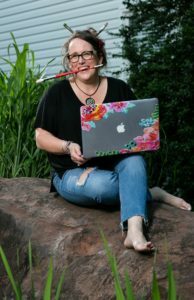 Big Rock Studio is owned and operated by me, LeAnne Poindexter, in Potomac Falls, Virginia. When I’m not working at the local coffee shop, I work in my home studio designing logos, websites, marketing materials and textile designs! To effectively communicate an idea FOR my client, I feel that it’s imperative that I communicate effectively WITH my client. Through years of experience, I can guide you as you define your message. Armed with information, we can set forth to create a brand that will help your company reach new heights! I enjoy the relaxed feeling of a coffee house for stimulating creative discussions. What do you say we meet up and create that next big idea? something given as a bonus or extra gift. 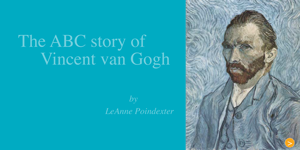 LeAnne’s ABC book about Vincent van Gogh!